A conservatory with a tiled roof can be a great addition to any home. It creates an additional living space that feels more like a permanent fixture than just a garden room with cooler summers and warmer winters. A conservatory with a tiled roof can also add up to 10% to the value of the house! Instead of looking like a bolted-on addition to the house, it becomes an extra room with more light that any other room! 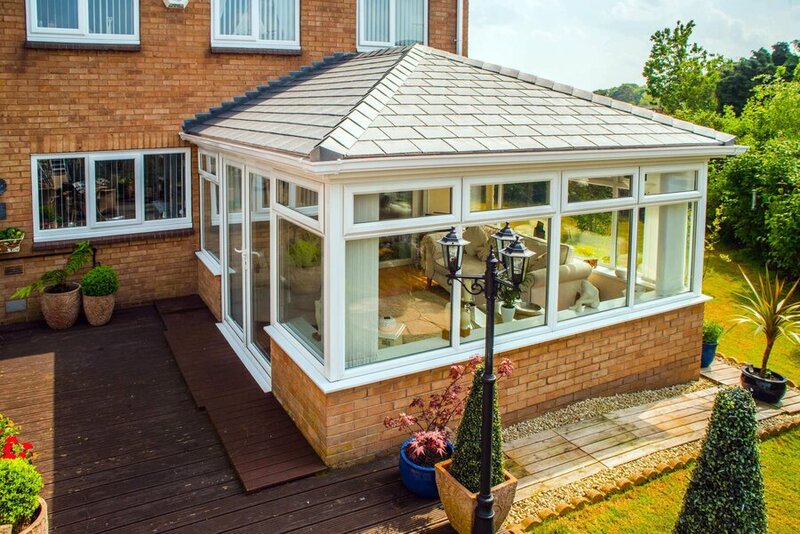 What Can Affect The Cost of a Tiled Conservatory Roof? – Roof design and the type of tiles. – How much work is required such as the removal of the old rood, structural work and any lighting and wiring. – Frame material. Aluminium, uPVC and timber all differ in price. How Much Does a Conservatory with a Tiled Roof Cost? A conservatory with a tiled roof costs more than a conservatory with a polycarbonate roof or a glass roof. This is mainly due to the more complex fitting process. However, the price is also affected by the number of roof windows you might want. At the very least, you should expect to spend anything from £4000 for a small conservatory, to £6000 for a larger one. In comparison, a glass conservatory roof for a 3000mm x 3500mm lean-to conservatory will cost you between £2,610 and £3,175. A polycarbonate roof is even cheaper, costing between £2,355 and £2,705 for a same sized lean-to conservatory. The price for a conservatory with a tiled roof may go much higher than that, based on the number of roof windows, the sizes, and the material you choose for them. What Type of Roof Windows Should You get for a Conservatory with a Tiled Roof? For a conservatory with a tiled roof, you would want roof windows to get more light in. As is obvious, a conservatory with a tiled roof will not get in as much light as a glass window. Roof windows are the perfect solution to that drawback. Roof windows, also called skylights, work very well if you want air and light in your room. They come in different styles and types of opening to suit the type of house you have. You can get a variety of features in them including electronically operated windows, solar powered roof windows, or remote controlled windows. They are even available in solar powered models, and those fitted with sensors that react to the outside temperature. They will open when it is warm outside, and close themselves when the sensors read low temperatures or signs of rain! What Frames Can I use for Windows on my Conservatory with a Tiled Roof? You can get roof windows in aluminium, uPVC, or wooden frames. Aluminium frames are cheap and offer variety in styles and colours. They are also light and flexible. However, they are poor at insulation and result in condensation inside the windows. For insulation, uPVC frames are better, but are a weaker material than aluminium. As a result, you would need thicker frames to hold the glass in place. Wooden frames provide great insulation and are strong. They look pleasing to the eye, and give a classic appearance to your property. What is the Average Cost of Roof Windows for a Conservatory with a Tiled Roof? The cost of roof windows for a conservatory with a tiled roof vary according to a number of factors. The material of the frames is just one of them. Their price may vary depending on whether they are double glazed or triple glazed. You might want large windows for your conservatory with a tiled roof, and they would cost more than smaller windows. As they are on the roof, you need to think about whether you want manually operated roof windows or if you would prefer electronic controls. What is the Estimated Cost of a Flat Roof Window for a Conservatory with a Tiled Roof? Let us take flat roof windows to get an estimate of the average price of windows for your conservatory with a tiled roof. As the name suggests, these are basic windows that lie flat against the conservatory roof. You may also get pitched roof windows for your conservatory with a tiled roof. They will just cost you more. A 550mm x 780mm flat roof window that is manually operated will cost you between £220 to £245 each, if double glazed. The same window, if triple glazed, costs around £380 each. A 550mm x 780mm flat roof window with electronic controls will set you back by £520 per unit, if you want the windows to be double glazed. If you want them triple glazed, you can expect to spend to spend around £670 per unit. What Are The Advantages of a Conservatory with a Tiled Roof? What can a conservatory with a tiled roof offer that an ordinary conservatory cannot? With a conservatory with a tiled roof, you can create a room, rather than an extension. To get a seamless blending of your property with your new room, a conservatory with a tiled roof is your best bet. A solid tiled roof is more of a continuation of your property. The look of a solid roof will blend seamlessly with your existing brickwork, making your conservatory look more like a true extension of your house. They can accommodate and integrate electrical elements, allowing you your choice of indoor lighting. A solid tiled roof will add a completely new dimension to any existing or new-build conservatory. If you are looking to revitalise your old conservatory then a tiled conservatory roof will certainly add value in terms of lifestyle and aesthetics. They are the perfect solution to creating extended comfort inside your conservatory, regardless of the temperature outside. In short, to get a permanent living space that is guaranteed to last longer, a conservatory with a tiled roof has no equal. A solid roof conservatory allows for electrical lighting. Getting the right lighting will help when it comes to the value of your conservatory, as well as making it much more liveable and enjoyable. As daylight fades, your conservatory lighting can create a relaxed, warm and welcoming to space to carry you through the evening. This is especially useful if you plan to use your conservatory as a second living area. Good lighting combined with comforting furnishings, will transform your conservatory into the hub of the home. Think about how you will use your conservatory and design accordingly. Different tasks will have different lighting needs. You might want to read in the evening or use your space to work from a laptop or computer. However, don’t make the mistake of thinking that brightness is everything. You don’t want to make the lighting too harsh. Natural light where possible is best. When looking at conservatory roofs, you should consider how you want to use your conservatory space. Do you want to invite with outside in? Create an area for the kids to play in or an entertaining space that catches the sun in the evenings? Investing in a quality design will only help you to enjoy your new conservatory better. Presumably, you will want a space you can use all year round and for your conservatory to be fully functional throughout the year, it needs to be well insulated. A solid conservatory roof provides excellent insulation, providing excellent temperature control. The design contains a rigid insulation board and usually, insulated plywood. As you must know, a polycarbonate conservatory roof provides very little insulation. A glass roof can provide good insulation. However, it also might let in too much heat and light on bright days. A conservatory with a tiled roof, on the other hand, gives you the best insulation. What’s more, it also doesn’t let in as much heat on warm days! What would a potential buyer want? A room which is usable all year round, with effective lighting and ventilation will certainly be more attractive than a room that is too hot in the Summer and unusable in the Winter. For a South-facing build, a glass conservatory roof can be a recipe for disaster. A tiled roof conservatory provides excellent temperature control throughout the year. You may be thinking that a conservatory with a tiled roof defeats the purpose of a conservatory because it limits light. A conservatory with a tiled roof can let in as much, or as little, light in as you want! All you need to do is install roof windows! You can get roof windows in a variety of shapes and sizes. They also come in a range of materials. If your conservatory with a tiled roof is facing a direction with a lot of sun, you can even get double glazed windows with tinted glass. This way, you get plenty of light but in a controlled manner. Does a Conservatory with a Tiled Roof Provide Better Sun Protection? Let’s face it: glass roof lets in too much sun. Unless you get tinted glass or expensive roof blinds, you cannot avoid that. 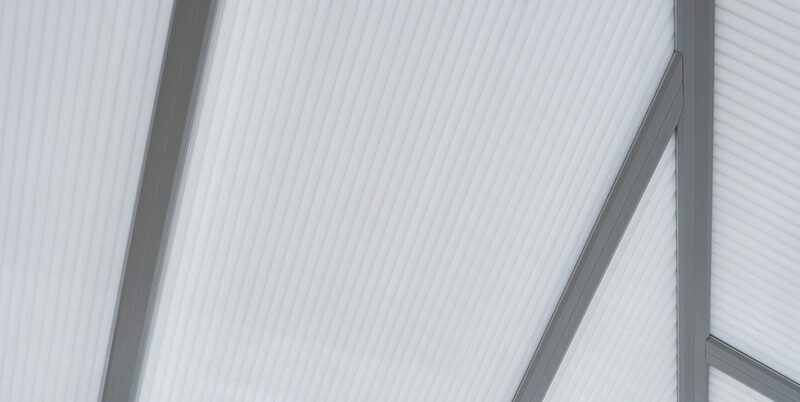 A polycarbonate roof limits the light to a great extent, but makes the room unbearably hot or cold, depending on the weather. A conservatory with a tiled roof is like the baby bear’s porridge from Goldilocks. It is just right! The roof lets in just as much sunlight as you want. A conservatory with a solid tiled roof can be used for both work and pleasure. Whether you want to watch TV or use the computer, it allows you to warm your room to a comfortable temperature. Also, as we saw earlier, it gives you better insulation so that even on grey days, you can enjoy your conservatory with a tiled roof. Does a Conservatory with a Tiled Roof Offer More Security? When compared to traditional glazed and polycarbonate roofing, a solid tiled roof offers extra strength and durability. Glass and polycarbonate never feel as secure as a conservatory with a tiled roof, do they? You may get reinforced glass, but it is still glass. A conservatory with a tiled roof can take care of that worry for you. You can get a room with all the light and space you want, but not have to worry about security. Does a Conservatory with a Tiled Roof Give Better Soundproofing? If you have a conservatory with a polycarbonate roof, you probably don’t like sitting there when it is raining. The sound of raindrops on plastic can be deafening! You might get sound of traffic if you live in a busy area. You may even have neighbours who are a bit noisy. Even a glazed roof cannot completely (and effectively!) soundproof your house. Neither polycarbonate nor glass can soundproof your house as effectively as a conservatory with a tiled roof can. 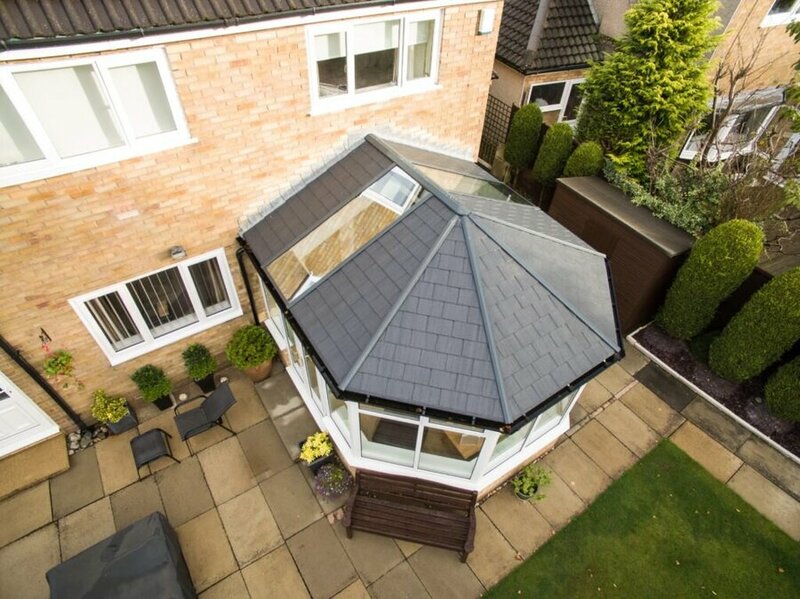 Are You Replacing the Old Roof on Your Conservatory with a Tiled Roof? Are you looking to transform how you use our conservatory space? If you have a conservatory that is looking a bit old and unloved and is no longer suiting your family’s needs, then it’s definitely worth considering a tiled roof as a replacement. A solid conservatory roof will allow you to control the room’s temperature much more easily. A Polycarbonate conservatory roof is probably the most affordable option however, a tiled conservatory roof offers way more benefits in terms of value & creating a liveable space all year round. 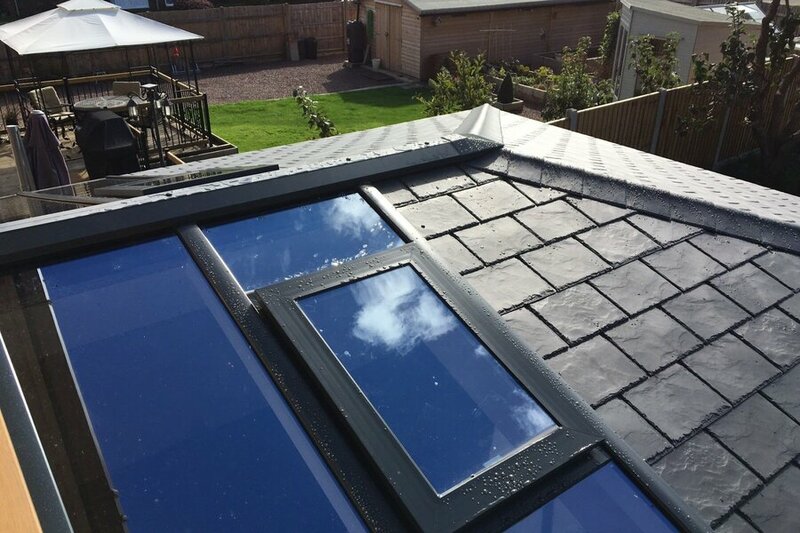 If you are looking to convert your current glass or polycarbonate roof, then you will need to make sure its existing base is able to take the weight of a solid roof. – New windows and door frames. The good news is that solid roofs can vary in how much they weigh. Lightweight tiled conservatory roofs can weigh around the same as a double-glazed glass roof. Increasing the weight of your roof by less than 10% is unlikely to cause any structural problems. A reputable installer will always conduct a survey before any work begins. It’s important to assess what alterations are needed to prevent the roof from collapsing. This owner chose to upgrade to eliminate the problem of their space being too hot in the Summer and too cold in the Winter. They wanted use of their conservatory all year round, with their new space functioning as a new dining room. Will the Foundation Bear the Weight of a Conservatory with a Tiled Roof? The foundation laid for a conservatory will be based on the weight and specifications of the materials used. A light, polycarbonate roof will not have the same weight as a conservatory with a tiled roof. Before you rush and replace the roof of your conservatory with a tiled roof, get a surveyor to assess if your foundation will hold the weight. If your old conservatory cannot get a tiled roof, you might have to stick with lighter roofs. Otherwise, you might consider taking it down completely and rebuilding your conservatory with a tiled roof from the foundation up. If you have the budget to do it, and are looking for a heat-efficient and permanent room, a conservatory with a tiled roof might be worth it. Do You Have Building Permission for a Conservatory with a Tiled Roof? A conservatory with a tiled roof is considered permitted development and as such does not require permission. You might need building permission for a conservatory with a tiled roof if your house is a listed property. If you have a house that is in an area of outstanding natural beauty, or in conservation land, you will have to get building permission. Do You Have the Budget for a Conservatory with a Tiled Roof? As you must have seen earlier on, a conservatory tiled roof costs considerably more than a polycarbonate roof, and even a glass roof. The cost goes up even more when you factor in the roof windows that you will need with a conservatory with a tiled roof. It is a hefty investment! Bear in mind that the energy efficiency of a conservatory with a tiled roof means that you will recover the money in a few year from your energy bills. You will also improve the value of your home, and the quality of your life. The conservatory with a tiled roof will get you more privacy. It will also give you a well-designed and properly furnished roof in any kind of weather. You need to be prepared for the initial cost of installing it. Before you go and buy a conservatory with a tiled roof for your house, we recommend you compare prices from different suppliers and installers. It is best to get quotes from at least three sources to give you a full idea of what is involved as well as prices. This will give you a good idea of the range of prices, and you will find yourself the best deal for your needs. To get a better idea of the cost of a conservatory with a tiled roof, check out our free online conservatory cost calculator. You can also get a quote for just replacing the roof of your conservatory with a tiled roof with our conservatory roof quote calculator! Please see below a list of tiled roof conservatory prices. Obviously, prices can vary depending on the supplier but this information should give you an indication of cost. This first table shows the price of lean-to tiled roof conservatories. Lean to conservatories are a very popular style due to their flexibility. You can add lean-tos to most properties, even with limited build-space. They can also be a more cost effective option to some other conservatory styles. Victorian conservatories can be a great addition to traditional properties with their classic design. Please see below some guide costs for Victorian conservatories with tiled roofs. Why not choose a beautiful Edwardian conservatory to gain that extra space. Having at tiled roof Edwardian conservatory will truly extend your home in style. Below are some prices for Edwardian conservatories with tiled roofs. Gable conservatories are a great way of adding a touch of elegance to a property whilst maximising space to get the most out of your the room available. Please see the table below which shows some guide prices for gable ended conservatories.